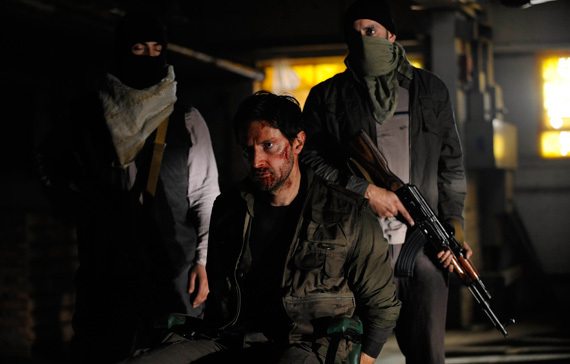 One of my readers named Minnie sent me a message that Cinemax has made Strike Back: Project Dawn episodes 1 and 2 available on their website for free. No login or membership is necessary but you are asked to enter your birthdate to demonstrate that you are old enough to view the show. I suspect you must be in the states to watch it from this site. This might default to episode 2 so check to see if you have to click on the Ep. 1 – Full Episode link. Thanks again to Minnie! The information is much appreciated. This entry was posted in Updates and tagged john porter, project dawn, richard armitage, strike back. Bookmark the permalink. Yup US only……bastards! I’ll have to wait for something less legitimate. Doesn’t work in Canada. What is their problem?? It’s not as thought it hasn’t already been aired on TV here even if not available to all of us. Really annoying! Thanks for trying anyway, B!! I prefer to remember JP as in original series! Just one thing…What’s with the writers and RA’s characters? They keep making a mess, completely destroy them Arghhh!! I told B we need to start a petition to have him stop getting killed. 🙂 This one was too much. Had to watch Vicar of Dibly to get it out of my head. In Canada, if you are a subscriber to HBO, you can also watch it online. But it’s not available to non-subscribers. Thank you for disseminating all the information you uncover and receive; kudos for sure. Thanks for the link but it wasn’t able to be used in Australia either. I still haven’t established when or how “Strike Back 2” will be shown here but I have an awful feeling that it’ll be on one of the pay tv channels. I refuse to subscribe as there are so many free-to-air channels available and I can’t keep on top of all the programmes I record now! I’m sad that JP had to die, though because I was hoping we might have found out if he reconciled with his family. Richard had to pull out of a few things he was offerred in order to play Thorin Oakenshield and I’m happy to wait for that. The saddest part is that Thorin also dies at the end!! 😦 I want to see Richard in a love story with a happy ending, I do not mind being cheesy! thanks for spoiling the ending! shant bother to watch now youve all told me who dies! Brilliant. Does anyone know the theme tune details? Good question, Tony. I don’t know off the top of my head. Maybe someone else can help? Found it on line. Th ethem is by The Heavy and called Short Change Hero!! Shame can’t watch it in UK! Thanks Ania – tracked Episode 1 through via youtube in the end. any way to watch ALL back episodes to get caught up? @donna: As far as I know, only the first two episodes are available as teasers through Cinemax without a subscription to their cable channel. Yes! Your video! Love it!